There are 7 posts filed in JOnAS (this is page 1 of 1). Here are the quick steps to configure a cluster of Jonas instances, with Apache and the module mod_jk. Continuous integration is a process that involves the build of the project but also the deployment of the artefacts (the term used with Maven). These artefacts are archives such as EAR, WAR, JAR files. 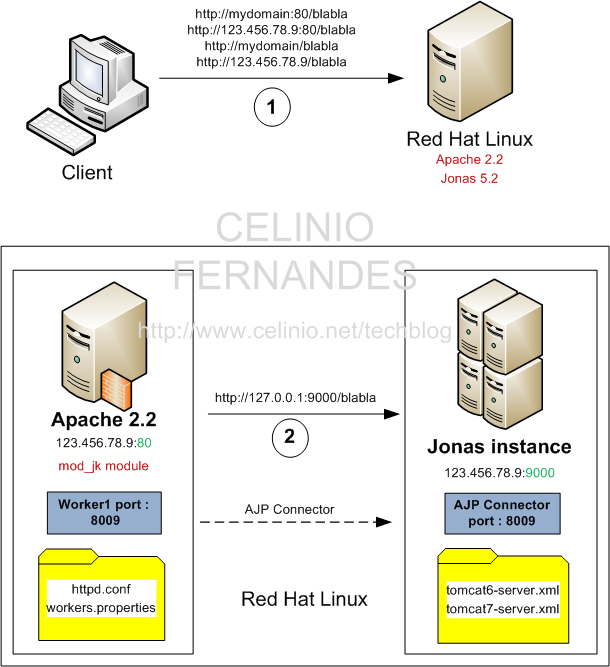 I had to write a shell script in Jenkins that would run just after the build and that would stop the JoNaS server, deploy the artefacts and restart JoNaS. The project is based on Maven. However to create a job that executes a shell script, the first option “Build a free-style software project” seems best, instead of the “Build a maven2/3 project” option. I chose to poll the SCM every 10mn. So that means JoNaS checks every 10mn if a commit occured during the last 10mn. If so, it builds the project again. And deploys it. Notice the highlighted line export BUILD_ID=dontKillMe. This is very important. I spent about 2 hours wondering why JoNaS would start and then would stop after 20 or 30 seconds. The reason is that Jenkins attempts to clean up after itself, so all processes that have that build ID are killed by default. So that processes do not accidentally leak and run the machine out of memory, for one. Here is a startup script for JOnAS, on Linux. It is a nice way to automatically start JOnAS when Linux reboots. It is quite trivial to write but I am sure it will turn out useful for anyone who is still not familiar with startup scripts on Linux. Call it jonas and save it in the directory /etc/init.d. You must be root to do that. #jonas Start the jonas server. /bin/su $JONAS_USER -c "$JONAS_HOME/bin/jonas -bg start "
/bin/su $JONAS_USER -c "$JONAS_HOME/bin/jonas stop "
To run another instance of JOnAS 5.2.1 on the same server one needs to change the ports of the new instance. To create a second instance, I just run the newjb command. Start/stop Jonas with Maven and Cargo. And deploy too. I found very little information on what to add exactly to the POM.xml file to start/stop Jonas with Maven and Cargo. So here is a quick example with a basic webapp application.